Item Size: H-15", L-13.75", W-12.5"
We are credible Manufacturer, Exporter and Supplier of Copper Steel Buckets in Delhi, India. These buckets are available with us in ample of specifications in terms of sizes, shapes, patterns and have matchless finish. Made from high-grade material, our Copper Steel Buckets are able to withstand extreme weather conditions. One can get Copper Steel Buckets from us in bulk and at marginal prices. We are a trademark organization which deals in supply of Copper Bucket to the clients. We offer our clients with a quality range of Copper Items, which is appreciated for its long lasting features. These items are at par with the international quality standards and are available in variety of patterns & designs. 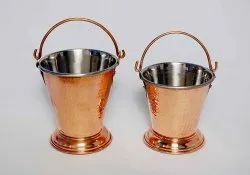 Keeping in mind the vast necessities of the patrons, we are engaged in providing wide range of Copper Bucket. 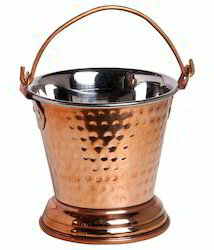 Owing to the rich industrial experience and expertise in this business, we are engaged in providing Copper Bucket.